We had a great family mini-vacation last year at the Great Wolf Lodge in Traverse City, MI, so this year, we decided to take another trip, only this time choosing to visit their location in Sandusky, Ohio. The main reason we did that is because of the drive time, which is about two hours shorter to the Sandusky location. We figured the lessened drive time would be more time we could enjoy at the park. We were a little nervous about our choice, because the Yelp reviews were about half a star different in favor of the Traverse City location, and some reviewers who compared the two said the Michigan location was better, so we were a little apprehensive. Turns out things were just fine! We really couldn’t beat the price of the deal. Since we stayed at a GWL last year, we get regular e-mails, and we received one with a code for a regular room rate of $109, which is just about the bottom you can expect to pay. With resort fees and taxes it worked out to $139 per night. We ended up paying $30 more for our trip, because at the time of reservation you can choose to take a chance on an upgrade to a better room style. If the room style is available when you get there, you’re automatically upgraded and charged the different amount. If it’s not you stay in your original room type, with no upgrade costs, of course. If it works out in your favor, you pay only about half the difference in room rates, so in our case the room style we got would have been $139 at booking, but we effectively paid $124 per night. Last year I mentioned how showing up around 1pm was a big mistake. That’s the time that you have access to the water park, so the lines were huge. This year we got there just around noon, and we were the third party in line. Our room was already available, so we got to grab our stuff, get changed, and were in the park around 1pm. I happened to walk through the lobby just around 1pm and the line was huge, so the lesson is to try to get there before that 1pm time frame. Lucky for us, that smaller drive time definitely helped! Rugs were stained (though not dirty) – The carpeting had quite a few stains. However, I wore white socks and they remained white, so they weren’t gross. With kids staying there all the time, there are naturally going to be spills, but it’d be nice if they worked a little harder to get the many stains up. Counter space – The room had a microwave, a mini-fridge, and a nice bar sink right in the room (the bar sink was a nice touch), but there was barely any counter room. I think they could have given an extra 2-3′ of counter space to make things a little easier for guests. Mattresses – The website claims that the mattresses have been recently upgraded, but either they aren’t finished, or the info on the website is outdated and they need to be upgraded again. There were definitely sunken spots where people normally sleep, indicating it’s time for replacement. you went down in a tube, either a single tube or a double tube. Both of these were a lot of fun. The Traverse City park did have a third slide that the Sandusky park did not, where you went down in bigger ‘rafts’ that they had to send up with a conveyer belt. That was a bit of a more wild ride, but it honestly wasn’t missed. The only other big difference is that the small slides that our kids loved last year were attached to the play area that the kids used. While they had the same type of slides, they were in a different pool, and accessing them meant that the kids had to run through a busy area, where last year it was all self contained. It was actually a bit overwhelming for our younger one, so she actually spent less time doing the slides at the age of 3 than she did at the age of 2. She did spend a lot of time in the main pool area. With the help of a life vest and ongoing swim lessons that she’s taking, she did a great job paddling around. My son loved pretty much everything. At the age of five, he could do pretty much everything without supervision. He still has to either wear a life jacket or have adult supervision in the main pool, and we always went up with him to the bigger slides, but he preferred going down by himself. We went during a pretty slow time of the year and also a slow part of the week (arrived on Sunday and left on Tuesday), so on the one night we decided to go to the restaurant, we had a very good experience. Many online reviewers complained that it was pricey and slow with average food. While it was pricey, we understand that anytime you eat in a place like this, it’s going to be just that, but it was nice to be able to leave the park, do a quick shower and change, and be sitting down to dinner less than an hour later. Maybe it was because of the slow time of year, but we felt the service was just fine, and the food was very good. We got mostly burgers and such, but we all got very nice sized portions and everything was good. They have a lot of things and activities you can do. The Sandusky location has a little spa that kids love, where they do manicures and pedicures and such. We didn’t do that for our daughter, as the pool kept her busy, but she’ll probably enjoy that when she’s a bit older. They also have the MagiQuest, a game where you buy a wand and load up with adventures, then have to go around the hotel finding various clues which, after you point your wand, will tell you the next clue. We stayed with some family friends, and they ended up getting this for two of their kids, similar in age to ours, and while they enjoyed it, they admitted that they definitely didn’t get their money’s worth. Our son went around with theirs for about 15 minutes, and while he liked it, he didn’t make it seem like he really minded that we hadn’t gotten it. They also do a story time for kids in the lobby. At first, there’s animatronic trees and woodsy characters that put on a little 10-minute show, which is kind of fun for the kids to watch. After that, one of the characters comes out as well as a staff member, and the staff member reads a book. The sound system is a little lacking, so the kids were definitely not as engaged. After it’s done, the kids can get their picture taken with the character, which they enjoyed. 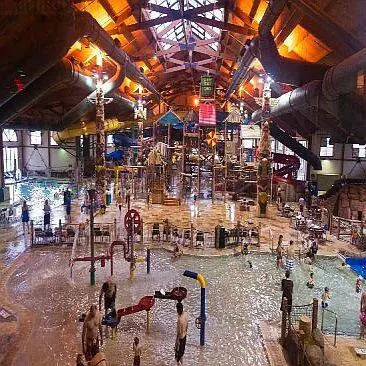 Once again, we had a great time at the Great Wolf Lodge, and the Sandusky location definitely met our needs. It is a bit smaller and a couple of years older, but for our 5 and 3 year old kids, it provided a great deal of fun and a much needed break from another long winter! There is one of these a few hours from us that I hear advertisements for all of the time. I’ve heard nothing but great reviews from everyone that has gone too. While we don’t have kids (yet), it is on the list to check out when they do come along. I always enjoyed taking family vacations as long as the kids were kept busy. This sounds ideal because of the water park.